The next generation of MAKEAS! Selling is an April 2018 Resolve x Modesty x Kingboy x MAKEA! 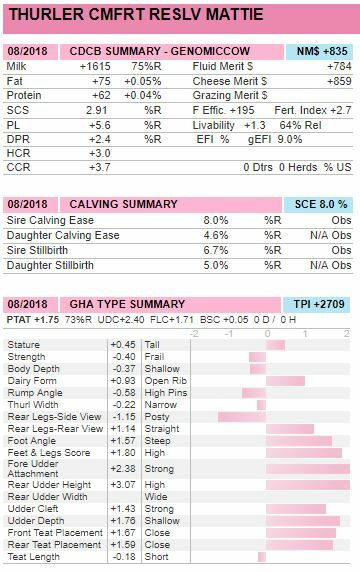 Thurler Cmfrt Reslv Mattie scores +2709G combined with +75 Fat and +62 Protein and over 1.70 UDC, FLC and PTA Type! April '18 Resolve back to genomic powerhouse MAKEA! Several generations have exported embryos!